What they say: A year has passed since the Tournament. Fletcher and Ignatius have been locked away in Pelt’s dungeons, but now they must face a trial at the hands of the Inquisition, a powerful institution controlled by those who would delight in Fletcher’s downfall. The trial is haunted by ghosts from the past with shocking revelations about Fletcher’s origins, but he has little time to dwell on them; the graduating students of Vocans are to be sent deep into the orc jungles to complete a dangerous mission for the king and his council. If they fail, the orcish armies will rise to power beyond anything the Empire has ever seen. With loyal friends Othello and Sylva by his side, Fletcher must battle his way to the heart of Orcdom and save Hominum from destruction…or die trying. I received a copy from the publisher (via NetGalley) in exchange for an honest review. What I say: I loved The Novice and have been impatiently waiting for the next instalment in Fletcher's story. I may have even whinged to Taran Matharu at YALC last year about the long wait after the HUGE cliffy ending! 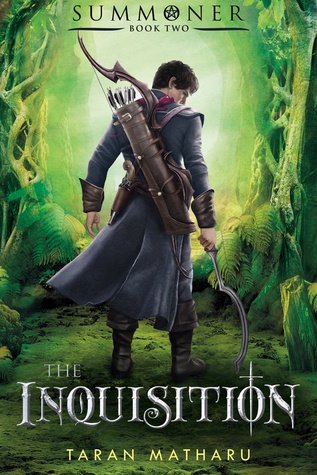 Did The Inquisition live up to the hype? Yes. Did I still enjoy the wonderfully complicated world Matharu created? Yes. Did I enjoy it as much as The Novice? Very nearly! The action picks up with Fletcher suffering from the huge consequences of the dramatic events at the end of The Novice. We see him on trial and in great danger from pretty much all sides. The Dwarfs, Elves and Humans have a very fragile peace and are only united in the common goal of fighting their shared enemy: Orcs! We're treated to some pretty big revelations but also meet many more secrets, lies and of course new characters. I'm being purposefully vague because I really don't want to spoil any of this clever story. I liked that the changes in Fletcher weren't overtly OTT because whilst it's nice to see him grow, I'm not a fan of stories where the main character's entire personality changes throughout a series. Fletcher is still Fletcher, but with more power. Although he's still a victim of circumstance at times, it was nice to seem him almost level out - he's a familiar and honest friend, with huge potential.